Merry Christmas Yin & Young listeners! Today, we're sharing a very special episode, particularly for those men looking for that special someone this holiday season and into the new year. 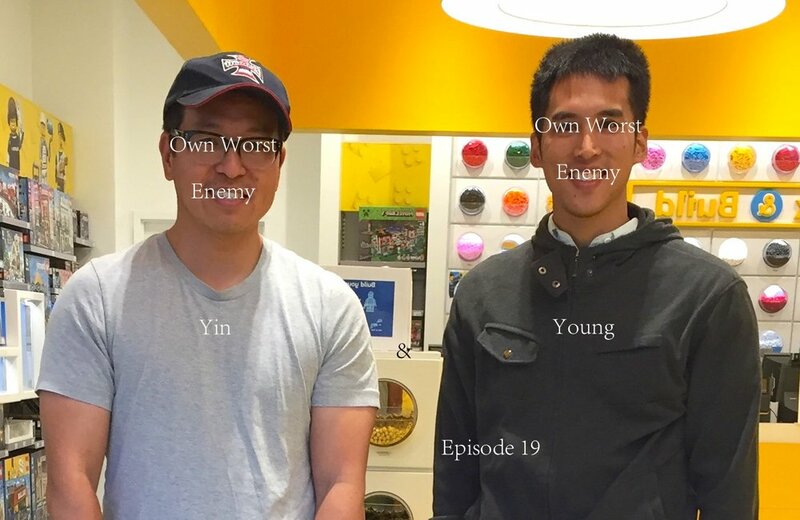 James (aka Young) interviews Jeremy Jong, an experienced relationship and dating coach with a focus on helping Asian American men attract the women of their dreams. Jeremy shares his strict Christian and Taiwanese tiger mom upbringing. Focus on inner work and keystone habits. Dealing with anxiety and toxic/sexual shame. Why the focus on the Asian American heterosexual male audience. Being proud of Asian culture and who you are. Use the testing mindset: Don’t over intellectualize, just go out there and practice. Compulsive pick up versus genuinely wanting to talk to a woman. Full video of Yin & Young EP36. Note: Video cuts out at 46:12, audio continues. Catching up on what we've been doing. What age difference is too great? Japanese - 有り難迷惑 - arigata meiwaku: feeling you get when someone offers unwelcome assistance and complicates matters, but you feel obligated to feel grateful because their intentions are pure. quàn jūn xī qǔ shàonián shí. Cherish the days of your youth instead. Lest you pluck but bare branches. In this episode Y&Y review: The Last Jedi, Blade Runner 2049, and Lady Bird. James shares his adventures in Seoul, South Korea and Taiwan, and has a personal revelation. * James had 3 issues with the movie: Luke, the jokes, and the romance between Finn and Rose. * Dan agrees with a friend that the opening joke wasn't great. Dan doesn't like the physics or inconsistencies in physics: Holdo's suicide maneuver, bombers in space, and the end scene on Crait with Rose's speeder intercepting Finn's speeder. * James doesn't like that Rey is so natural at wielding a lightsaber. * Canto Bight scene’s totally useless. * Anyone can use the force. * Dan - it's very racially monochrome, no diversity in the future. Didn't bother him, but it was shot beautifully. The movie was a little long. * James - the use of Asian items without Asians. The film hypersexualizes women. Feels there’s a plot hole with the “real memory”. Still, an enjoyable film with some beautiful moments. James - reminded him of "Rushmore". Lots of teen angst and intelligent humor. A little salty a Californian wasn’t cast for the lead, but not a deal breaker. Not sure what Lady Bird's motivation is. * Daniel - thought it was overrated, but enjoyed it. * James went to Taiwan for preproduction on his short film. Did some location scouting. Also shot a mini-short film while there. * James tried Tinder in Taiwan. Got 4x more likes in Taiwan vs. in America. * More dating opportunities for Asian American men. * Had a great date with a Japanese girl he met at a Taipei intersection. Focused on getting to know her emotionally. * Seoul, Korea - Super cold weather. James doesn't speak Korean. Hung out with Teo. Met with Seng and his wife, had Korean BBQ. Had ginger chicken soup. Stayed in 3 different areas of Seoul: Hongdae (홍대/弘大), Gyeongbokgung (경복궁/景福宮), Sadang (사당/舍堂). * Saw a gorgeous girl at the restaurant and gave her his Kakao username. Was one of the scariest moments he ever had. * At another restaurant, James sees an attractive girl and asked her for directions to the palace. The girl writes detailed directions for James and lets her food get cold, despite his polite protestations. * He talks to some girls at a bar with no success. * James realizes the reason why he seeks women's affection. Dan: All my grievances with “The Last Jedi” have to do with physics. Teacher: You have to answer that for yourself. Japanese - 今は今しかない - imawaimashikanai - There is only now, now. Mandarin - 活在當下 - huó zài dāngxià - Live in the moment. Yin & Young EP29 (30 sec trailer). LIVE STREAM Tonight 9p-1030p PST: Just a Bad Date? Tune in TONIGHT 9PM-1030PM Pacific Time for our first live podcast! We’ll be discussing bad dates vs coercion, sexual boundaries, and male/female (mis)communication. With special guests Laura Cox and Aaron Estrada. Catching up on what they’re watching: Dan is watching a bunch of TV shows (see links below). James watched "Me, Earl, and the Dying Girl" and spiraled him into a funk. James remembers his last day with his friend, Reggie, who passed away from cancer. Reggie knew when it was his time. Dan shares the story of his uncle's passing earlier in the year. Dan's dad tells offensive jokes. James reflects on his paternal grandmother, grandfather and their impact on his life. Thoughts on work, rest, and success. Taiwanese - 時間實在過了很快 - sikafn sidzai koealiao cviaa kirn - time goes by really quickly.